An emergency first aid situation can be as simple as a scraped leg, to as nerve wrecking and scary as a sudden cardiac arrest. Be it at the office, on the road or in the comforts of your home, ResQr empowers you with clear, step-by-step instructions that empower you to be the rescuer in any situation. Compliant with American Heart Association, American Red Cross, Medic First Aid, Coast Guard, and other training organization protocols. 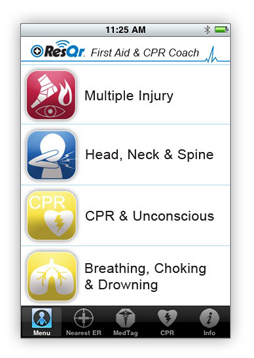 Get real-time coaching through any emergency first aid situation. Powerful source of refresher training to improve skill retention in first aid and basic life support procedures anytime, anywhere. Have peace of mind knowing you're prepared for the unexpected no matter where you go. Simple to use, simple to understand, always there when it's needed most. 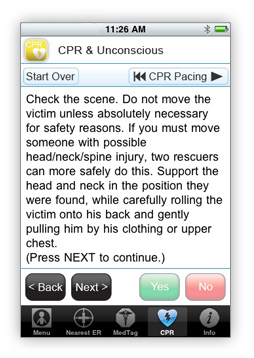 Hundreds of first aid scenarios, including topics such as CPR, choking, bites, burns, seizures, diabetic emergencies, severe wounds, head injuries, and many more. Proper CPR pacing metronome and adult instructions. 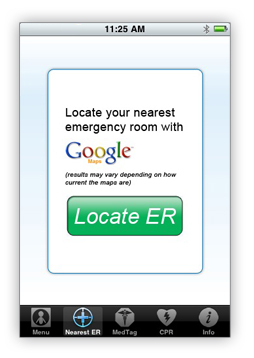 Uses Yes/No questions to deliver step-by-step, real-time instructions for hundreds of medical emergencies. 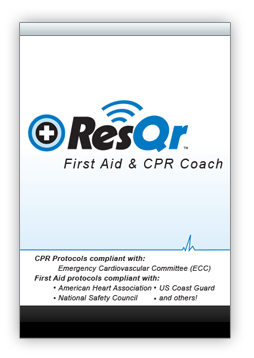 As safety standards and protocols improve, ResQr First Aid & CPR will be updated to track those changes. Emergency instructions stored on your iPhone, so you have access to step-by-step instructions any time.